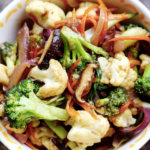 This is probably one of the best veggie stir fry recipes I've found. It has just the right amount of sweetness and crunch. The sesame, broccoli, and shiitake mushrooms just bring it all come together. Chop the onion in half, then slice into long, thin strips. Peel and dice the garlic finely. Put the onion and garlic, along with the two tablespoons of extra light olive oil and a sprinkle of salt into the frying pan for now. Chop the broccoli and cauliflower into small florets (the smaller they are, the easier they are to cook) and measure out about 2 cups. Use a julienne peeler to slice the carrot into long thin strips, or simply slice the carrot in whatever shape you want. De-stem the shiitake mushrooms and slice them in small pieces, and finally, chop the bok choy in half, then in half again, then again. Combine the broccoli, cauliflower, carrots and shiitake mushrooms in a large bowl and keep the bok choy separate by itself. Turn the frying pan with the onion and garlic to medium high (6 or just under, don’t let the stove turn red). Stir and fry the onions and garlic for about 7 minutes, then add the broccoli, cauliflower, carrot and shiitake mushrooms. Let it cook while you’re stirring for 5 minutes. Meanwhile in a small bowl, add the soy sauce, cornstarch, cooking wine, sesame oil, rice vinegar, tahini, molasses, ginger powder and red pepper flake together. Stir until everything is mixed evenly. After 5 minutes of cooking the vegetables, add the bok choy, the sauce mix and stir it around a lot, cooking for a final 8-10 minutes. At this point, you want to be always stirring so the bottom doesn’t burn.